​Twelve Foot Ninja drop new single and video Sick, announcing the Sick tour - their first national headline tour of Australia in over two years. The track Sick is taken from their ARIA nominated album Outlier that debuted Top 5 US Billboard Hard Rock Albums, and #6 on the official ARIA chart. Arguably one of the most innovative heavy bands in the world today with their unique blend of hard rock and other genres rarely associated with head banging, Twelve Foot Ninja have already won the respect of heavy music lovers in the US winning Best New Talent at America’s Golden God Awards. Twelve Foot Ninja are known for pushing the boundaries of music convention and fan engagement. The band’s music video for Sick is a nine-minute short film with three chapters leading to a dark but hilarious conclusion. To understand how Twelve Foot Ninja developed a fervent underground following and garnered international attention, you have to see them live. They have amassed an enviable following of fiercely loyal, yet musically open-minded fans thanks to their two EPs, debut album Silent Machine, and most recently released ARIA-nominated album Outlier. 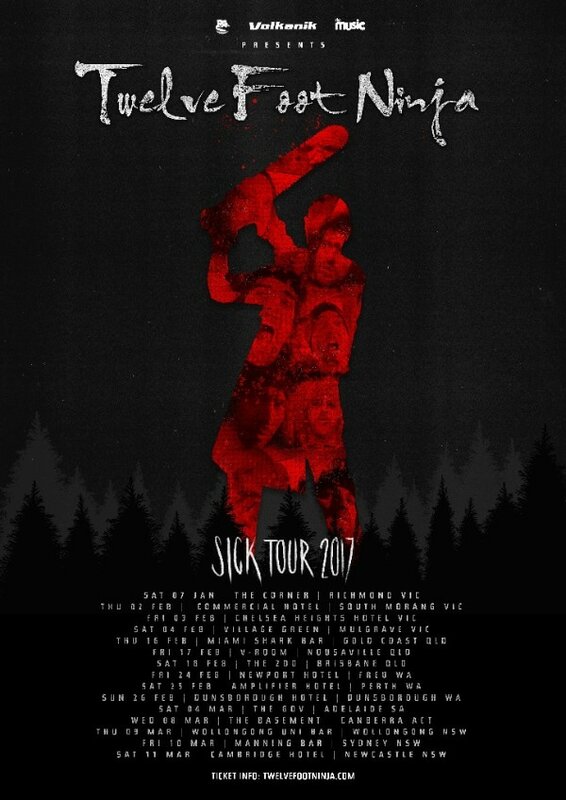 The Sick tour in 2017 will see the band freshly primed from a US festival tour and massive arena shows with Disturbed, who hand picked Twelve Foot Ninja to be their Australian tour support this month.